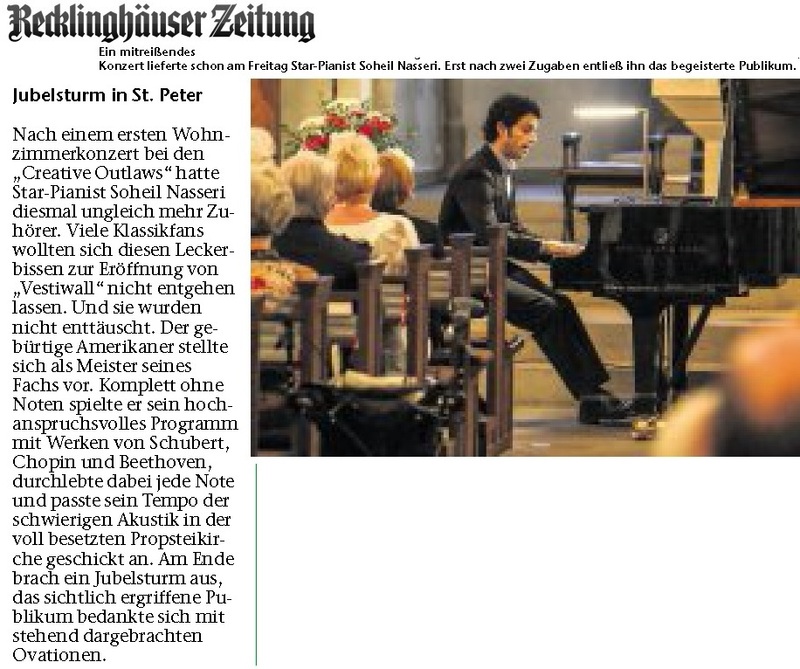 Recklinghäuser Zeitung: "A cheering frenzy in St. Peter"
Photo caption: Star pianist Soheil Nasseri gave an exciting concert on Friday evening. The enthusiastic audience only let him leave after two encores. Having first played a house concert for “Creative Outlaws”, Star Pianist Soheil Nasseri had a disproportionately larger audience this time. Many classical music fans did not want to miss this delicacy- the opening concert of the “Vestiwall”. And they were not disappointed. The American-born is a master of his craft. He played his demanding program of Schubert, Chopin, and Beethoven completely without music, and in the process lived every note. He was able to deftly adjust his tempo to the difficult acoustics of the sold-out Probstei Church. At the end there was a storm of cheering and the visibly moved audience payed tribute with a standing ovation.